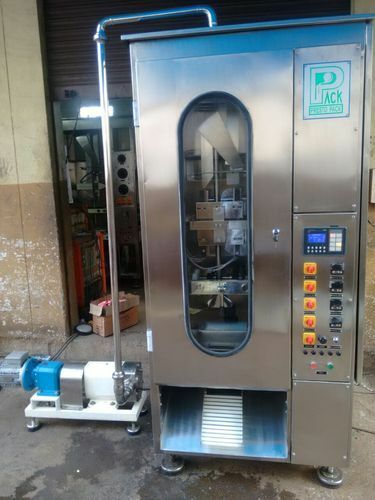 Fevicol or distember packing machine. Any Adhesives or Gum Materials also upto 1kg. Our firm Presto Pack Systems Private Limited was founded in the year 1996 as the eminent name responsible for manufacturing, exporting, supplying and wholesaling of Automatic Packaging Machines. Designed and developed in accordance with the industry laid parameters, these products are imparted with rugged design and capability to deliver excellent performance. For our customers, we have brought forward Edible Oil Packing Machine, Oil Packing Machine, Liquid Packaging Machinery to cater to the filling tasks of viscous liquid such as edible oil, vanaspati and non-edible oil. Pneumatically operated these machines are available at industry leading prices. We deliver our products with Assured Quality with Modern Technology. In order to bring forth products of incomparable quality standard, we have developed our workplace over a wide area. There, we have made assortment of latest range of machinery in order to accomplish the manufacturing task in an efficient way. Team incorporated with us comprises personnel with years of industry and are successfully handling the entire venture. Throughout the procedure, we follow and maintain stringent quality protocols and thus, ensure our offered range to be of flawless configuration. Thereby, we are here to make our customers satisfied in terms of products offered from our end. Owing credit to our customer-centric approach, we have developed business terms with some of the reckoned names in the industry such as Gujarat Ambuja Exports Limited, Dhamani Brothers and Bhaskeris Oils Limited. Our exporting countries include Malaysia, Sri Lanka, Nepal ,Nigeria, Uganda.